When you feel angry, resentful or hurt and you want to talk with your partner, being understood and listened to is probably important to you. If the situation directly involves your mate, you most certainly want to feel like your words are being heard and listened to with respect. You probably want to move closer to your partner and resolve the tension between the two of you and, at the same time, you want to communicate about your perspective on the issue. Sometimes, maybe more regularly, it might seem like the only thing your partner does when you try to talk about your feelings and views is to blame or negatively judge you. It can feel like you are being disrespected or discounted and this only adds to the distance in your relationship. You can’t simply ignore your feelings or bite back every word you want to say to your partner….but you are tired of being blamed for everything that is “wrong” in your relationship! As stuck, tense and painful as communication seems to be in your relationship right now, you can turn this dynamic around. You can even experience improved and closer communication even if you are the only one working on this! The effects can be even more positive when both you and your partner are making different communication choices. Jeremy feels like Angela blames him for every difficulty that crops up in their marriage and family life. Last week, for example, Jeremy and Angela were talking about the trouble their teenage daughter has been in. Their daughter, Jenny, was recently caught shoplifting cigarettes from a neighborhood convenience store. Angela is embarrassed and horrified that their daughter would do such a thing and she is also shocked to discover that Jenny smokes. Jeremy asked Angela if they could talk about the situation before sitting down with Jenny. He wants to come to the conversation with Jenny as a united front. It is Jeremy’s intention to find out more about why Jenny would do such a thing and to make it clear to her that her actions are unacceptable. Ultimately, Jeremy is worried about their daughter and would like to support her in making different decisions. When Jeremy begins to share with Angela his intention for this talk with Jenny, she interrupts him and says that he is being too soft as usual. Angela goes on to say that Jenny’s troubles come mainly from having a father who lets her get away with anything. Needless to say, Jeremy and Angela’s talk about Jenny dissolves into more harsh words and ends up with the two of them more divided than before. When you feel blame, look to yourself first. Whether you feel like your partner blames you for challenges or if you tend to do the blaming, we recommend that you start out by looking within yourself. We’re not saying that you are actually the one to blame or that your mate is not playing a role in whatever discord has developed in your relationship. This is not about your mate (or you) getting a “free ride” when it comes to responsibility. Blame is a strong and potentially destructive action. 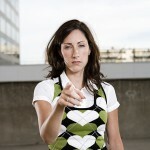 Equally intense emotions are usually linked in with blame. The person who blames another often feels afraid, embarrassed or as if a situation is uncomfortably out of his or her control. Blame can seem like a way for that person to protect him or herself and to grasp at a sense of control. The trouble with blame, however, is that in just about every circumstance, there are many “sides.” More than one person is usually playing a role in the situation or dynamic. If you feel blame– either coming from your own mouth or being directed at you– recognize it. Do not react. Instead, take some time to figure out what this blaming statement really means to you. If you can get to the emotions that are beneath the blaming, you can begin to soothe yourself and then choose a response. As Jeremy recalls his recent argument with Angela, he taps into the way he feels about being blamed. He can re-focus his attention on how frightened he is about Jenny and how sad he feels that he and Angela could not come together the way he wanted them to about this. Jeremy is able to let go of the defensiveness he initially felt when Angela blamed him and to return to his deeper emotions as well as his original intentions– to be a united front with Angela and to ultimately support Jenny in making different decisions. When Jeremy and Angela sit down together to again try and talk about the situation with Jenny, Jeremy feels calmer and clearer. We will not interrupt each other while talking. We will use a timer and each person will be given 5 minutes to talk at a time. We will keep our talk focused on what we can do to improve a situation. We will listen fully to each other and try to stay open. We will not use words like “blame” or “your fault”– instead we will look at the problem together and brainstorm about possible solutions. If one or both of us needs a short break or “time-out” to process intense feelings, we will agree to a period of time and then return to our talk after that. These communication agreements might not fit your relationship situation. Feel free to use them as a starting point and change them to match the dynamics in your relationship. As you gain more clarity about what you are feeling, you can better know what requests you’d like to make of your partner when it comes to how the two of you interact and talk together. 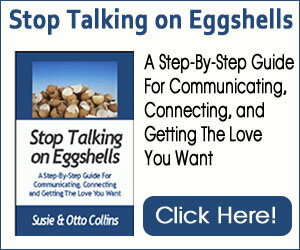 You can move beyond blame and create communication agreements that will help you and your mate move closer together.